Easy step-in fin with one cinch strap makes fin kicking a breeze. 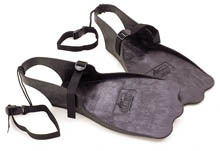 Secure with Kicker Keepers wich clip onto the fin and straps around the leg and buckles. Make sure to also order the Kicker Keepers...they're worth the extra bucks.